Scars are the result of the body’s natural healing process. When an injury to the skin occurs, the body forms new collagen fibers to mend the wound. These fibers may look different in color or texture from the surrounding skin. This inconsistency may be significant enough that people want to remove the scar. Scar revision is intended to improve the cosmetic appearance of skin irregularities and blemishes resulting from prior injury or unsatisfactory surgical repair. Depending on the type and severity of the scar, it can be treated in many ways. Scar repair depending on the type and severity of the scar Keloids and hypertrophic scar tissue - can be prevented by immediate use of silicone cream or silicone sheets following surgical excision. Another treatment option is steroid injections to reduce the size of the keloid. Some superficial scars can be treated with laser resurfacing. Some scars are simply excised and closed in a more meticulous fashion. Others require rearrangement of adjacent skin to break up the scar line (such as Z-plasty). 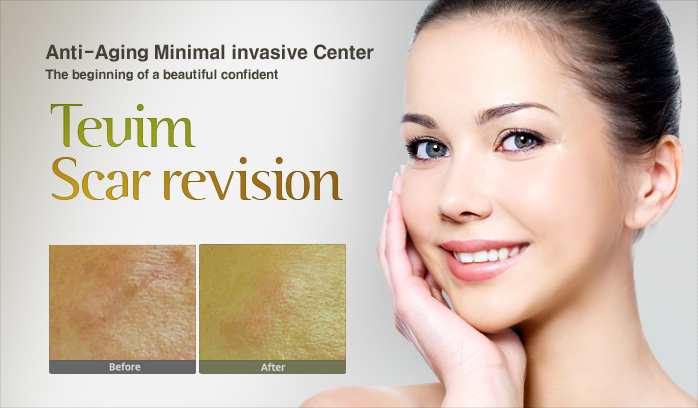 Some superficial scars can be treated with laser resurfacing.